“What do you think of skating bears?” That question, from a dear friend, began a column I wrote in 1991 following a weekend gathering with “girlfriends” in Colorado’s high country. Betty died a couple of years ago from a brain aneurism, quickly and much too young. Her younger sister, Faye, also a life-long friend, brought a copy of the column when she visited me recently. We spent the weekend as usual, talking, remembering and laughing. I waited until she left to read the column, knowing I would cry, which I did. Faye and I exchanged a look that said: “We love her anyway,” and we continued down the road basking in the brisk mountain air and friendships grown stronger over time. There’s something invigorating and yet calming about both. Faye, Betty and I go back to days of youthful expectations centered on societies design for happiness: love, marriage and children. Over the years we’ve each strolled our paths, finding disappointments in that design and healing strengths in our ability to adapt and go on. Perhaps it is because of those forced concessions that we grew into who we are today. Or maybe it is whom we were, common in stubborn determination that allowed us to fight the winds and continue to reach toward the sky. No matter, we share a common kinship cemented long ago and erected over time. After re-reading the column, I sat back, closed my eyes and tried to recapture Betty’s face. It came to me in that moment, eyes dancing like a skating bear and wearing her trademark grin, which always made the one she directed it at feel properly put in place but glad of heart. The column ended with these words: Friendship is like a remembered and cherished grin that draws love’s emotions and allows our acceptance of the other. It’s invigorating and calming in moments when we least expect it. Funny how thoughts of a particular person tie us to memories of food. Thinking of Betty, reminded me of a time, more than 40 years ago, when she prepared a barbecue at her house in Salina, Kansas. She grilled hamburgers and dressed them with a sweet barbecue sauce made from scratch. Afterwards I requested the recipe and she wrote it out on a 3”x 5” index card. 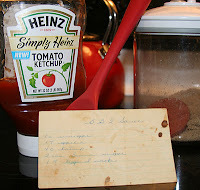 I made the sauce several times then stuffed the card away in an old brown index box I inherited from my Aunt Myrt. After Faye and Montana, the Saint Bernard she inherited from Betty, left my house on Sunday, I retrieved the brown box and found the card, yellowed with age, spotted with ancient barbecue sauce and written in Betty’s tiny but precise and curly style. Each line straight, each letter perfectly formed, each curl added with a slight, non-pretentious flare. No directions, just the ingredients; Betty gave me credit for knowing how to put it together. 1. Place all ingredients in saucepan and cook, stirring constantly, until sugar dissolves, 3-4 minutes. Continue cooking and stirring 1-2 minutes longer. Store any left over sauce in refrigerator. 2. Grill or fry hamburgers to desired doneness and toast hamburger buns. 3. Spread 1-2 tablespoons warm sauce over hamburger meat and top with chopped cabbage. 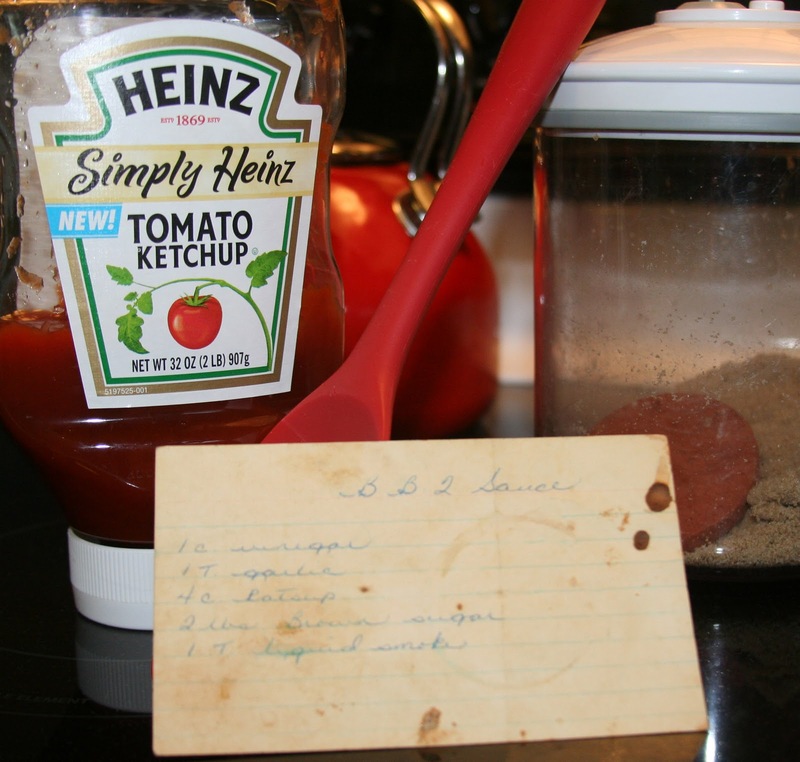 Chef’s note: Use this sauce in place of purchased barbecue sauce when grilling chicken or ribs. However, cook meat until done first and then lightly baste with sauce for the last minute of cooking to prevent burning. It is sweet so a little goes a long ways.